The Burgundians were an east-Germanic tribe. Firstly they were settling around the Baltic Sea, and on the island Bornholm. They were driven from the shores by the tribe of the Rugii which Tacitus mentions as a part of the Suebi tribal alliance. During the second century there are mentions of the Burgundians that were settling in between the Oder and Vistula rivers. They started migrating in the 3th century along the Maine River and they arrived at the borders of the Roman Empire. They crossed the frozen Rhine river in 406 along with the Vandals, Suebi, Antes and Alemanni. The Burgundians found Roman Gaul in a chaotic state, where the emperors were constantly changing due to barbarian onslaughts. The Burgundians supported one such emperor, Jovinus (Gallo-Roman senator), and they established themselves around the Rhine territories. In spite of the fact that Jovinus was soon dethroned, Constantius, the commander of the forces of Emperor Honorius, was not able to expel the Burgundians. In 413 the emperor gave Gundahar (also Gunther), the Burgundian king, the right to form a sovereign kingdom in the Rhine region with the capital in Borbetomagus, which is the town of Worms today. There the Burgundians were converted to Arian Christianity. Gundahar started pushing westwards, but his troops were defeated and he was killed by Aetius, the Roman governor of Gaul, with the help of Hun auxiliary troops. After Gundahar’s death the fight between his heirs and the Franks continued. In 534 the last Burgundian king Gundomar was defeated by Chlodovech’s sons and his kingdom was annexed to the Meroving state. The Burgundians fought as Roman allies against the Hunnic campaign which was led by Attila (451). Aetius granted them the right to settle in Sapaudia. The western Roman emperor Anthemius (467 – 472) maintained very good relations with the Burgundians hoping that they would help in the conflict with the disloyal Visigoth king Euric (466 – 484). Gundioc was the king of the Burgundians in that period. His wife was the sister of Ricimer, who was the magister militum per Italiam. On Ricimer’s suggestion Anthemius granted the Burgunds two thirds of the fertile land, one third of the slaves, and half of the forests and fields in Gaul. Nevertheless Gundioc showed disloyalty, he captured Lugdunum, modern Lyon, and established the Burgundian kingdom. 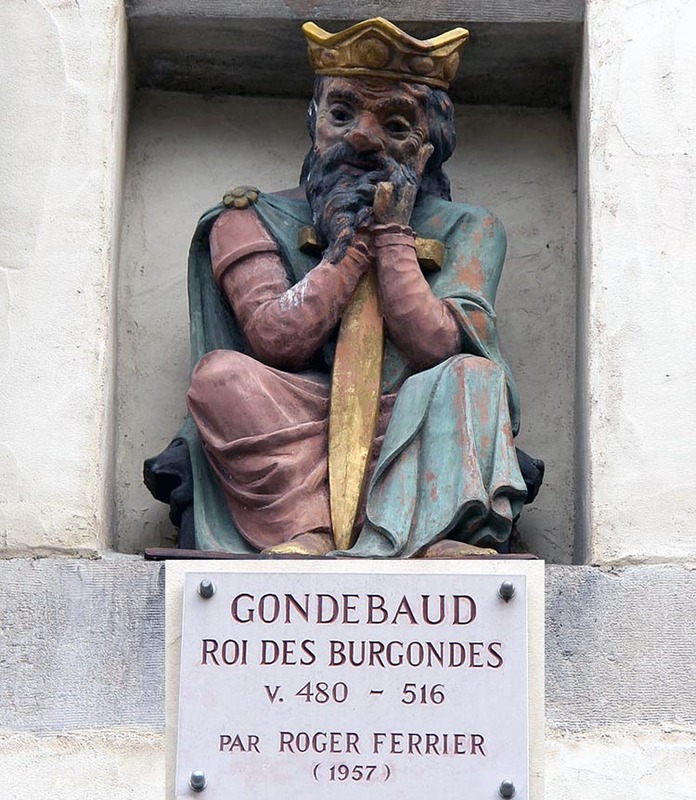 Gundobad was the son of the Burgundian king Gundioc. In 472 he was granted the title of magister militum per Italiam, but he resigned from this position in 474 hoping to claim the throne. Gundioc died in 480. Under the patrimonial law of succession the fiefs of the deceased were divided into parts, and each part was granted to one son. According to these laws Gundioc divided his kingdom in three parts. The ambitious Gundobad dealt with one of his brothers easily, but there was a long conflict with the other brother, Godegisel. The conflict soon developed another, religious dimension. Although Godegisel enjoyed Frankish support, Gundobad nevertheless prevailed. Gundobar became the sole master of the kingdom. To strengthen his position and to reconcile the Romans and Burgundians, Gundobad codified the Lex Romana Burgundionum. This code of law gives us insight into the structure of the society: 1) aristocracy; 2) a middle class that is owning land; 3) a lower class which owns no land, which is dependent on the aristocracy; 4) Coloni; 5) Slaves; 6) Freemen. Gundobad intention was to preserve the middle class, since most of the Burgundian soldiers came from this class and they were not allowed to sell their land. Gundobad waged war on his neighbors, primarily the Franks. In 500 Chlodovech (481 – 511) defeated Gundobad at Dijon, but Gundobad was able to resist the Franks at Avignon. Peace was established and we find Burgundian forces on the side of the Franks in the battle of Vouillé (507) gainst the Visigoths. They defeated the Visigoths and occupied the Provence region. They were defeated by the Ostrogoth king Theodoric the Great (493 – 528). When the Burgundians made peace with the Ostrogoths Gundobad married his son Sigismund to Theodoric’s daughter. In 523, the sons of King Clovis I (Clothar, Childebert, Chlodomer and Theuderic) were attacked Burgundian’s. The Burgundian’s were completely defeated by the Franks 532 AD at battle of Autun and two years later in 534 Franks annexed Burgundy.